Personal Style is what you wear that sets you a part. That element of your look that says ‘me’ as apposed to ‘her’, ‘trendy’. or ‘expensive’. What sets you apart may be subtle, small details, but it’s always something that’s inherently ‘you’. Personal style is important because God made us each unique individuals. If we simply copy trends in order to attain style, our efforts can feel meaningless. But embracing our individuality adds depth to our quest for style, and can turn fashion into a way to give glory to the vast creativity of our Father. 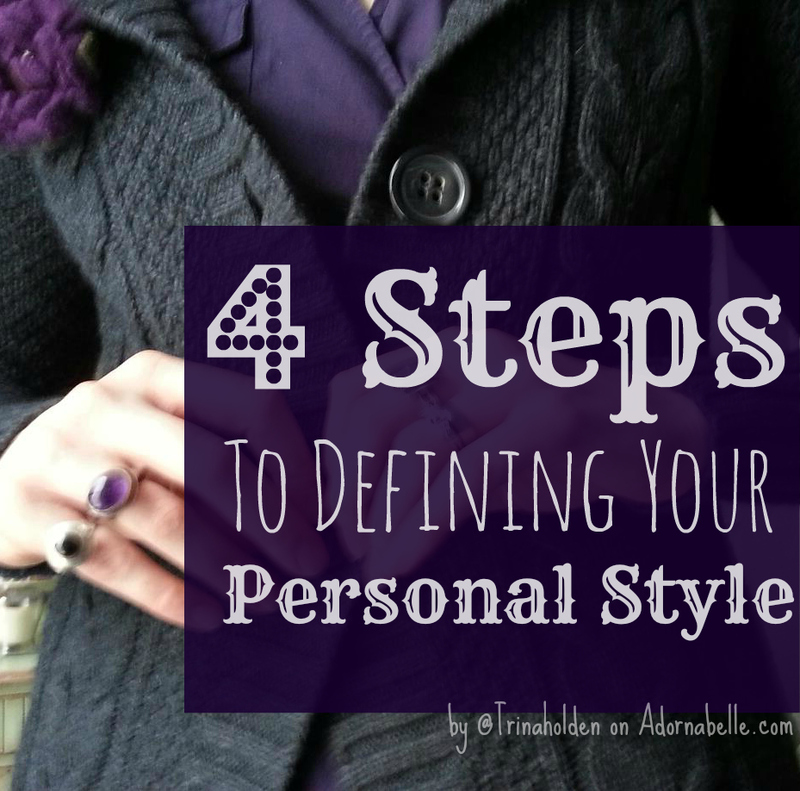 So, how to we identify and build our personal style statement? 1. Enlist Help. 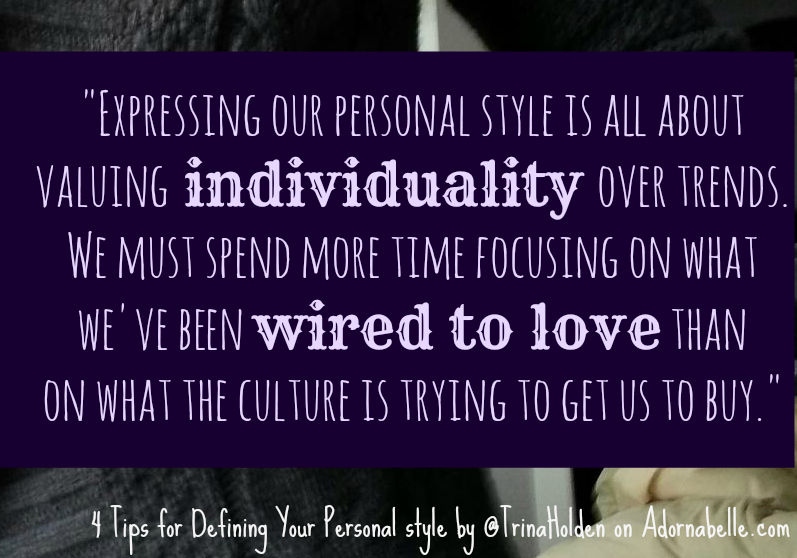 Just because the goal is individual style does not mean we need to isolate ourselves on the journey. Get some girlfriends on board with you. Dialogue about your goals and ideals, your victories and your struggles. Go shopping together, share inspiration, get good and opinionated with each other. Talking about your questions and quandaries in community lets the power of a team enter the equation. 2. Become a Copycat. Just because your style is individual, doesn’t mean it can’t be inspired by someone else’s. Just make sure you’re copying the right people. Someone who is shorter than you, older than you, or has vastly different body shape or coloring is not going to help you, no matter how cute their style is. I recommend creating a style board on Pinterest of figures that echo your own age and build. Once you’ve pinned a few dozen photos of looks you love, you will be able to stand back and see a pattern emerging. The common elements of your pinboard are what you should look at to recreate your style. 3. Sort it out. Your closet is another place where you can catch glimpses of your personal style, thought often that picture is diluted with clothes we don’t wear anymore, or stuff we shouldn’t have bought in the first place. Sort your closet mercilessly into 2 piles: Stuff You Love to Wear and Stuff You Have to Wear Because You Have Nothing Else To Wear. Although the proportions of the resulting piles may be depressing, you will have accomplished two things: 1.) You’ve shown yourself that you do, occasionally, know exactly what you love, and 2.) you’ve given yourself guidelines for items to never buy again (like that length skirt, cut of shirt, or shade of green). 4. Branch Out. Finally, it’s time to try something new. The best place to do this is at the thrift store, or–better yet–a friend’s closet. You want to try out new colors, shapes, and fit without the burden of feeling like you have to love it because you spent that much on it. Experiment by spending less than $10 on something that’s a complete departure from the basics you fall back on, yet appeals to you personally. Learn to always include at least one of those items unique to your personal style whenever you get dressed. Expressing our personal style with what we wear is all about valuing individuality over trends. We must spend more time focusing on what we’ve been wired to love than on what the culture is trying to get us to buy. The result of this shifted focus will be a wardrobe that sings of individuality and brings us joy no matter what the latest fad might be. These four steps for defining your personal style are an excerpt from my new book Embracing Beauty: Practical Style for Every Shape and Season of Motherhood. 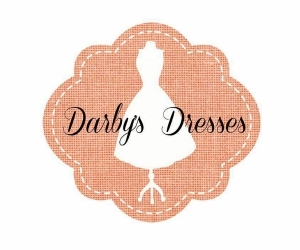 I’d love to help you learn how to choose a personal color scheme, dress your body through the changes of pregnancy and nursing, and even how to thrift shop with kids in tow! Get your copy here and we’ll do this together! Oh, my, wow, this was so helpful, Trina! Thank you! I pinned this for future reference and made my own style board on Pinterest (don’t know why I hadn’t done that before…thanks for the “permission”). My favorite point is the copycat line. I definitely have friends who’ve got the style that’s pretty “me.” Having the, again, “permission” to turn my admiration into action is causing some ideas to brew! Hooray! I’m so excited to hear of the progress you’re making, Rachelle! And ‘turning admiration into action’–wish I could have put that line in the book! That’s exactly the idea. I love this! Expressing our personal style is a great way to glorify the Creator. My style is very feminine. 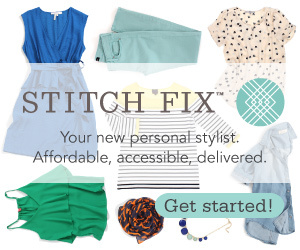 Almost every outfit has a girly touch, like ruffles, lace, a ribbon belt, or flower pin. I also love big earrings. As comfy as sweats are, I just don’t feel like myself in them. I can’t leave the house without a distinct feminine touch. I didn’t realize how much my style was recognizable until I visited a friend last week. We hadn’t seen each other in several months and you know what she said to me before anything else? “Your earrings! Oh, how I’ve missed your earrings!” Ha. Great blog! I’m looking forward to more. I can tell the message behind it is God glorifying! Tereasa, you KNOW you’ve made significant progress with your personal style statement when people start to recognize it! love that story. What great tips! Thank you, Trina, I especially like the point about looking to others for inspiration. I do that and sometimes feel guilty for not being “unique”. (Then again … my interpretation of another’s style is always unique! 🙂 ) Thanks for “permission” to do that … I’ll enjoy it more now! Thank you! These are some helpful tips. I do feel I get trapped sometimes in mostly wearing clothes from the “Stuff You Have to Wear Because You Have Nothing Else To Wear” pile. I definitely could branch out a little, to find something new and great to wear. This article has inspired me to purge my closet seperating out my clothes. I definitely have some of those that I wear because I *have* to and am not necessarily attached to the clothes. My best friend became Goodwill when I started working in a professional setting and found that I had very little clothes that fit that criteria. I think I have figured out what colors look best on me, something I never gave much though to before. Jaclynn–yeah! love to hear you’re making progress with your color scheme! Doesn’t it feel wonderful? You’re so welcome, Alice! And thank you!